Altador Alley is a new sponsor area located within the Altador Cup game area. The two sponsors are Kraft Macaroni and Cheese and Popsicle. Yet again, this promotion is not available to all players; only US residents can participate. 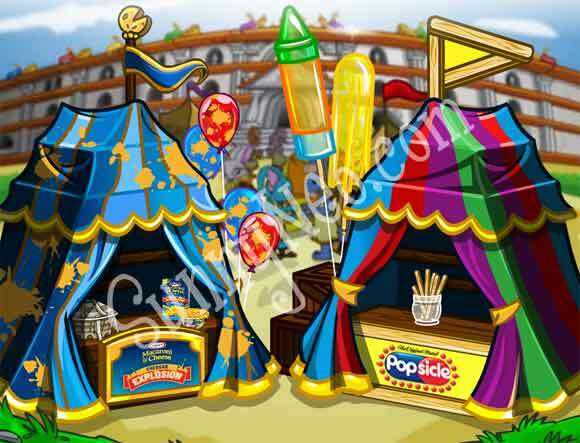 In each tent there are daily activities that can win you neopoints and/or item prizes. Daily Bonus Prizes are regular items available on Neopets, the theme seems to be items that can explode or pop. Examples: Deluxe Ruki Cracker, Meerca Negg Bomb, Jhudoras Exploding Muffins. The tent on the right is sponsored by Popsicle. There are several activities within this tent. June 17 How can you find the answer to a riddle on a Popsicle ice pop? Eat the whole pop!